On Friday, 20 April 2018, Israeli forces killed 4 Palestinian civilians, including a child, and wounded 274 others, including 41 children, 6 women and 1 journalist, in addition to hundreds suffering tear gas inhalation, including PCHR’s fieldworkers who were documenting the Israeli forces’ suppression of the entirely peaceful demonstrations near the border fence with Israel, east of the Gaza Strip. For the fourth week in a row and upon a decision by the Israeli highest military and political echelons, the Israeli forces used lethal force against the peaceful protesters, who did not pose any threat to the soldiers’ life. Thus, the death toll has risen to 33, including 4 children and 1 photojournalist, and the number of those wounded has risen to 2436, including 410 children, 66 women, 22 journalists and 9 paramedics, since last 30 March. 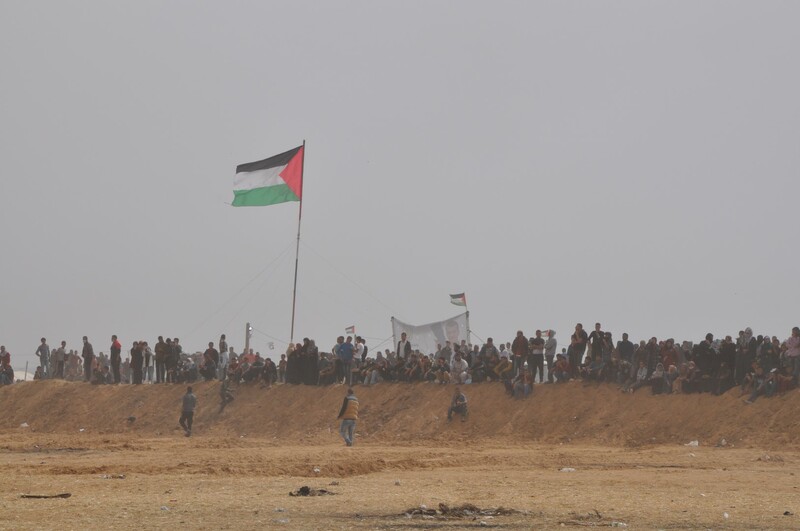 The Israeli Forces increased the height of the hills on which the Israeli snipers position so they would have a clear view of the area while dozens snipers continued to position behind the sand barriers, hills and military jeeps along the border fence in the eastern Gaza Strip. 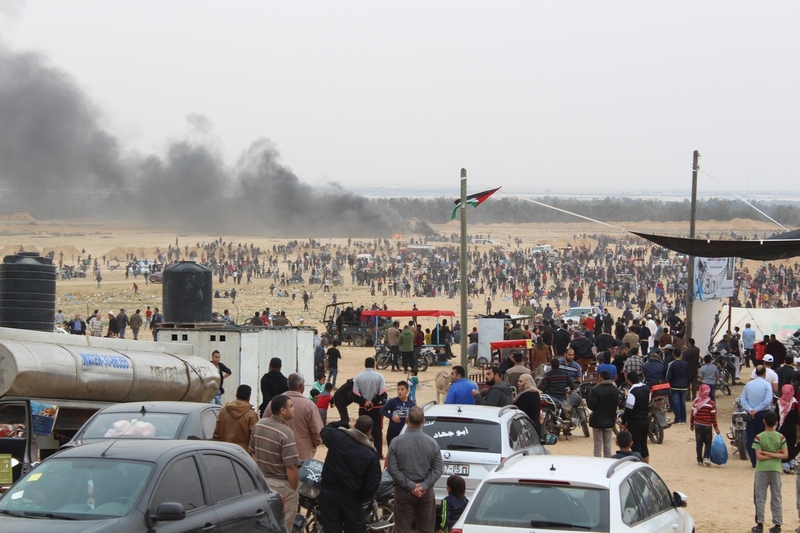 The Israeli snipers deliberately and selectively opened fire at the participants in the peaceful demonstrations which included thousands of civilians in 5 areas in the eastern Gaza Strip. 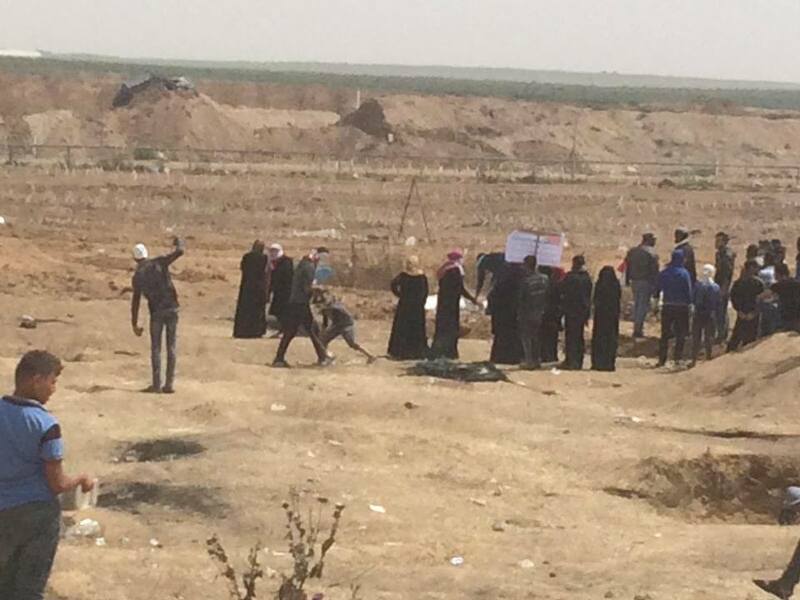 As a result, 4 civilians, including a child, were killed and 274 others were wounded, noting that most injuries occur in the demonstration area which is around 50-300 meters away from the border fence. 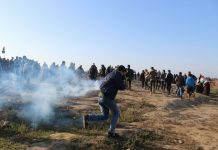 For the second week in a row, the Israeli forces fired tear gas canisters which fell on the field hospital and medical center belonging to al-Barakah Algerian Association in Khuza’ah and its surroundings. As a result, the medical crews were forced to vacate the hospital and center for some time, noting they are 800 meters away from the border fence. 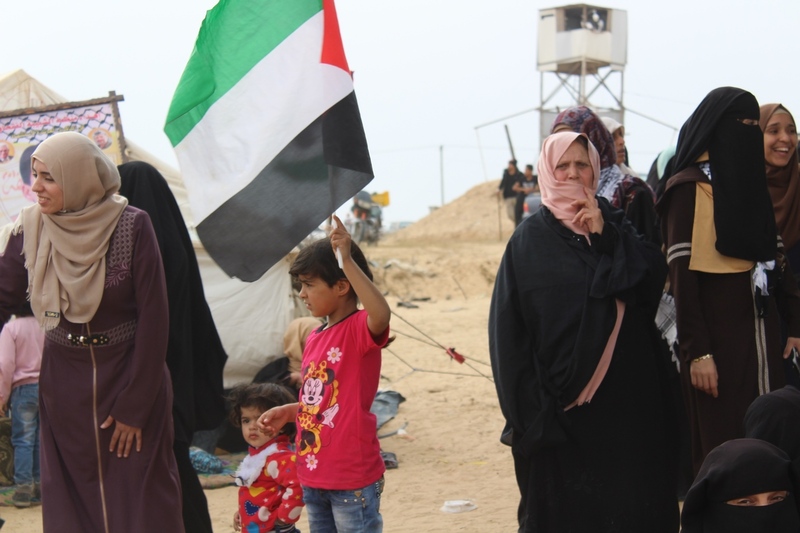 Since early morning, ten thousands of civilians, including women and children within entire families, started swarming to 5 camps established by the Supreme National Authority for the Great March of Return and Breaking Siege in eastern Rafah City; Khuza’ah in Khan Younis; al-Bureij in Central Gaza Strip; Sheja’eyah neighborhood in Gaza City; and Eastern Jabalia in the northern Gaza Strip. At approximately 07:00, the Israeli forces early opened fire in eastern Khuza’ah, wounding a civilian. In a similar shooting incident occurred at approximately 11:15 in eastern Jabalia, another civilian was seriously wounded and his death was immediately declared. Following the Friday Prayer, at approximately 13:30, the number of participants in the five demonstrations increased, reaching to hundred thousands of men, elderlies, women and children. 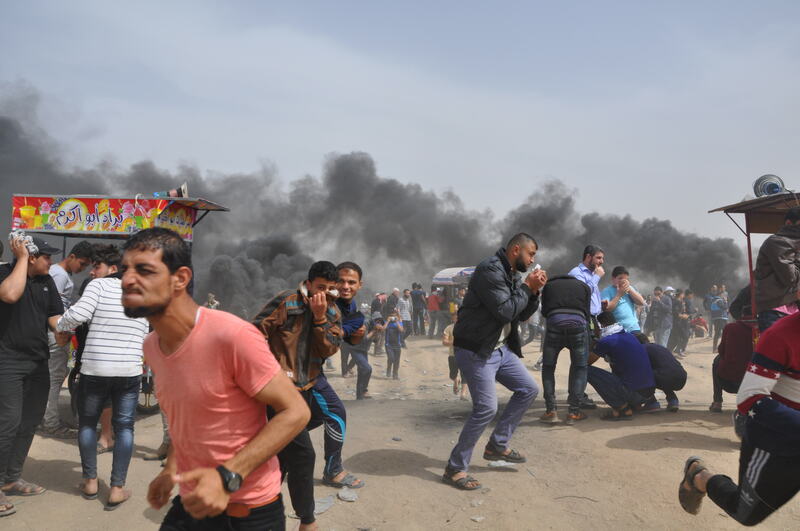 They deployed inside and outside the camps yards, raised flags, and chanted slogans and national songs in addition to flying kites, while hundreds of them, including children and women, approached the border fence, set fire to tires and attempted to throw stone. The activities were only about raising the Palestinian flags, chanting slogans and burning the Israeli flags. 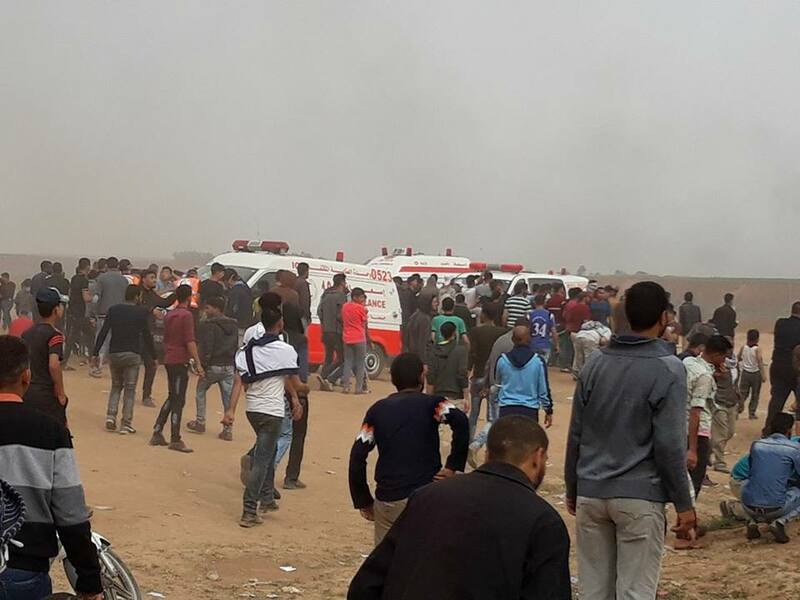 The Israeli shooting which continued until 19:00 according to PCHR’s fieldworkers in the 5 areas resulted in the killing of 4 Palestinian civilians, including a child. Three of them from the northern Gaza Strip were around 100-150 meters away from the border fence, east of Abu Safiyah area, northeast of Jabalia. 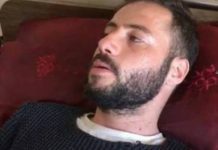 Ahmed Nabil Mohammed Abu ‘Aqel (25) from Jabalia refugee camp was hit with a bullet to the head; part of which was crushed, at approximately 11:15 when he was in northeastern Jabalia. His death was declared at approximately 13:15. 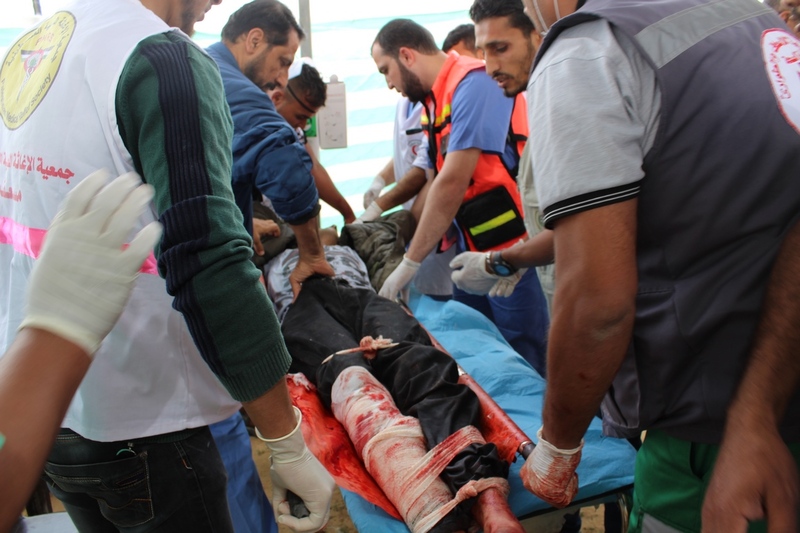 Ahmed Rashah ‘Abdullah al-‘Athamnah (24) from Beit Hanoun was hit with a bullet to the back at approximately 14:40 when he was in northeastern Jabalia. Mohammed Ibrahim Ayoub Ayoub (14) from Jabalia refugee camp was hit with a bullet to the head at approximately 15:45 when he was in northeastern Jabalia. Sa’ed ‘Abdel Majid ‘Abdel ‘Aal Abu Taha (31) from al-Qararah in Khan Younis was hit with a bullet to the neck at approximately 18:00 when he was around 70-100 meters away from the border fence, east of Khuza’ah in Khan Younis. 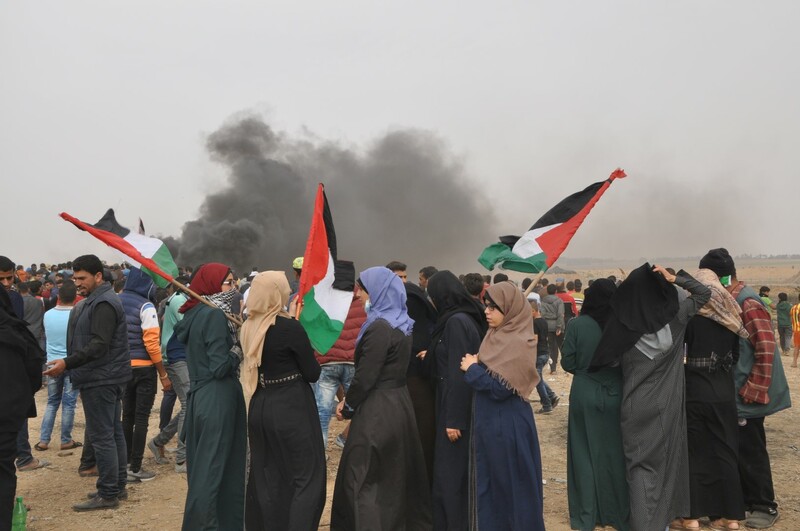 Moreover, 274 others were wounded, including 41 children, 6 women and 1 journalist in addition to hundreds suffering tear gas inhalation, including PCHR’s fieldworkers while documenting the Israeli forces’ suppression of the entirely peaceful demonstrations. 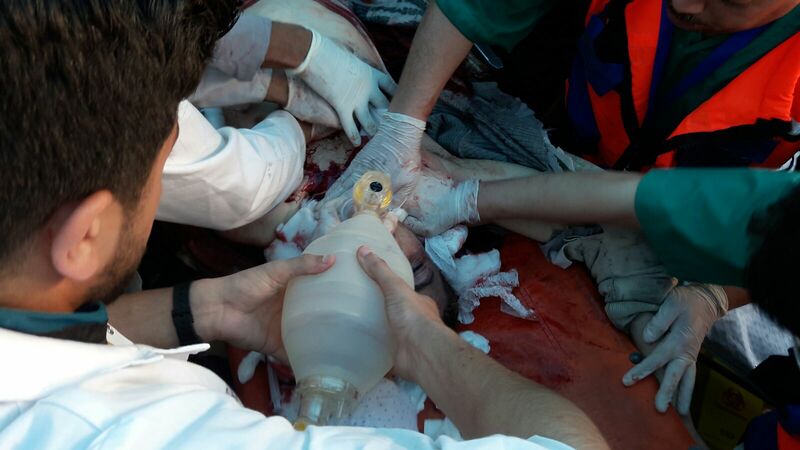 PCHR emphasizes that this high number of killings and injuries due to the Israeli forces’ live fire and tear gas canisters is unjustified as civilians who practice their right to peaceful assembly are being targeted. 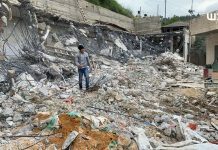 PCHR also stresses that this ongoing policy by Israel violate the Rome STATUTE OF THE INTERNATIONAL CRIMINAL COURT and Fourth Geneva Convention, and its practices qualify as war crimes. 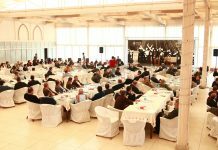 Thus, PCHR emphasizes that those involved in issuing decisions and orders in the Israeli forces at the political and security echelons and those applying the orders shall be prosecuted and held accountable. 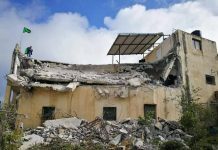 PCHR hereby condemns this new crime committed by the Israeli forces, believing it is as a result of Israel’s enjoying impunity thanks to the U.S. and Europeans and so encouraging the Israeli forces to commit further crimes upon an official decision by the highest military and political echelons. PCHR also reiterates its call upon the High Contracting Parties to the 1949 Fourth Geneva Convention to fulfill their obligations under Article 1; i.e., to respect and ensure respect for the Convention in all circumstances and their obligations under Article 146 to prosecute persons alleged to commit grave breaches of the Fourth Geneva Convention. PCHR calls upon Switzerland, in its capacity as the Depository State for the Convention, to demand the High Contracting Parties to convene a meeting and ensure Israel’s respect for this Convention, noting that these grave breaches constitute war crimes under Article 147 of the same Convention and Protocol (I) Additional to the Geneva Conventions regarding the guarantee of Palestinian civilians’ right to protection in the occupied territories.